By: Haley Shaneberger. Albums sold Years the album has been out YXYX Nirvana. 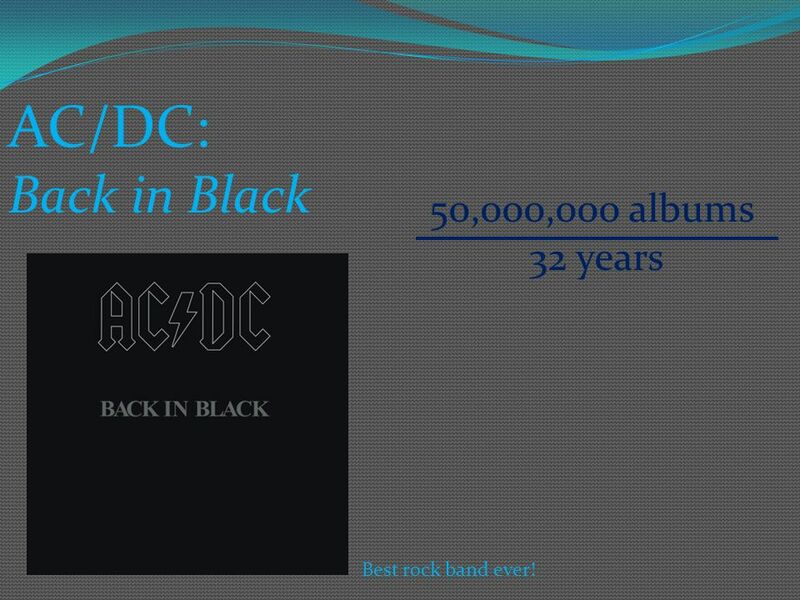 3 AC/DC: Back in Black 50,000,000 albums 32 years Best rock band ever! 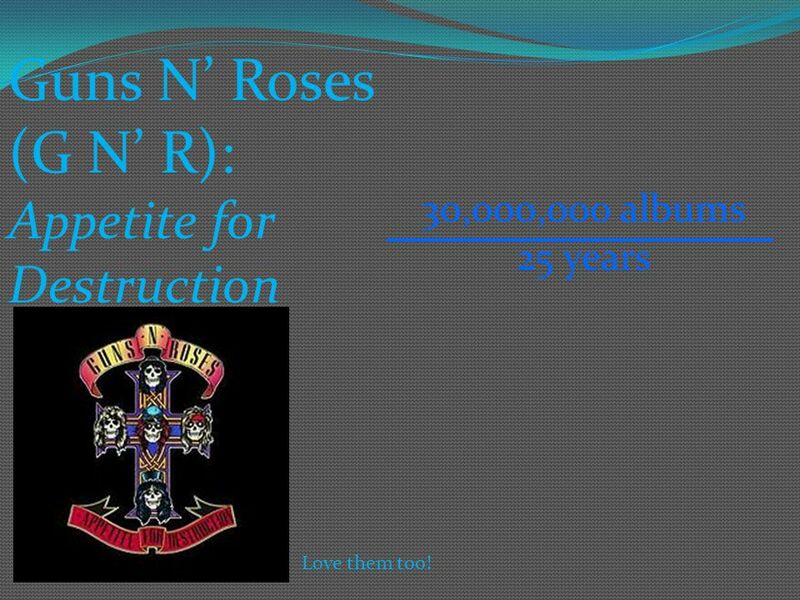 4 Guns N’ Roses (G N’ R): Appetite for Destruction 30,000,000 albums 25 years Love them too! 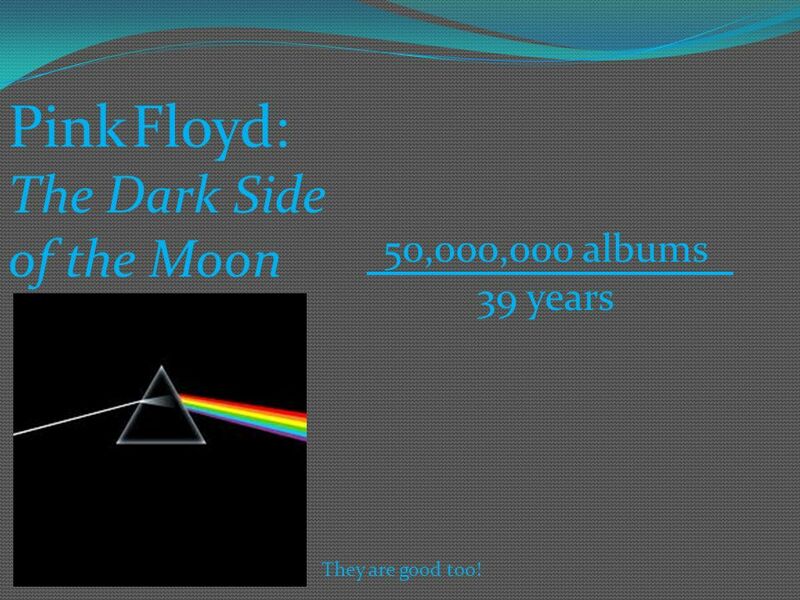 5 Pink Floyd: The Dark Side of the Moon 50,000,000 albums 39 years They are good too! 6 Nirvana: Nevermind Album cover not appropriate 30,000,000 albums 21 years Love their songs! 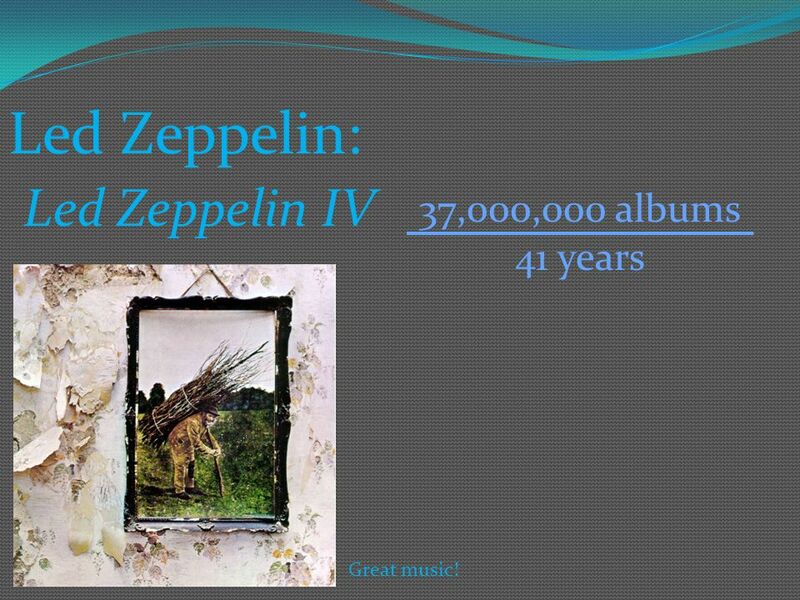 7 Led Zeppelin: Led Zeppelin IV 37,000,000 albums 41 years Great music! 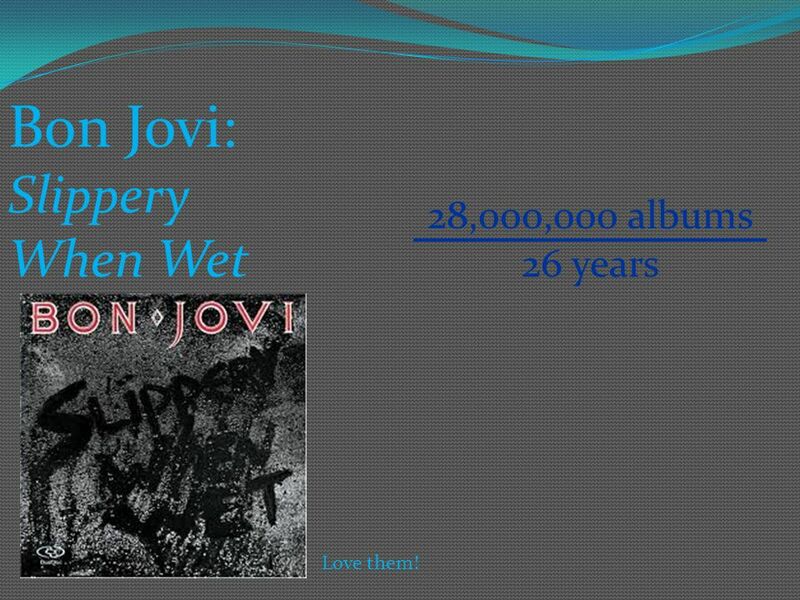 8 Bon Jovi: Slippery When Wet 28,000,000 albums 26 years Love them! 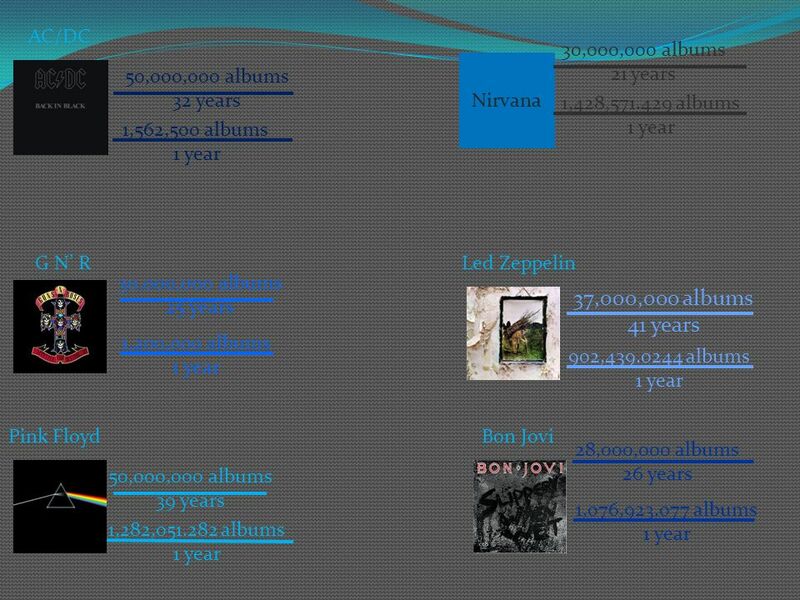 12 Nirvana Nirvana has sold 30,000,000 albums in 21 years, which means on average they sold 1,428,571.429 albums in 1 year Led Zeppelin sold 37,000,000 albums in 41 years, which means on average the sold 902,439.0244 albums in 1 year. 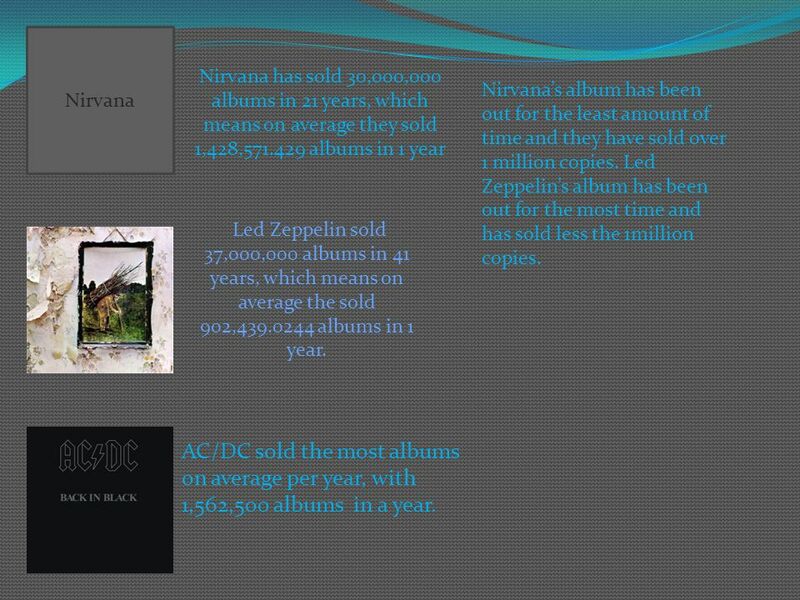 Nirvana’s album has been out for the least amount of time and they have sold over 1 million copies. Led Zeppelin’s album has been out for the most time and has sold less the 1million copies. 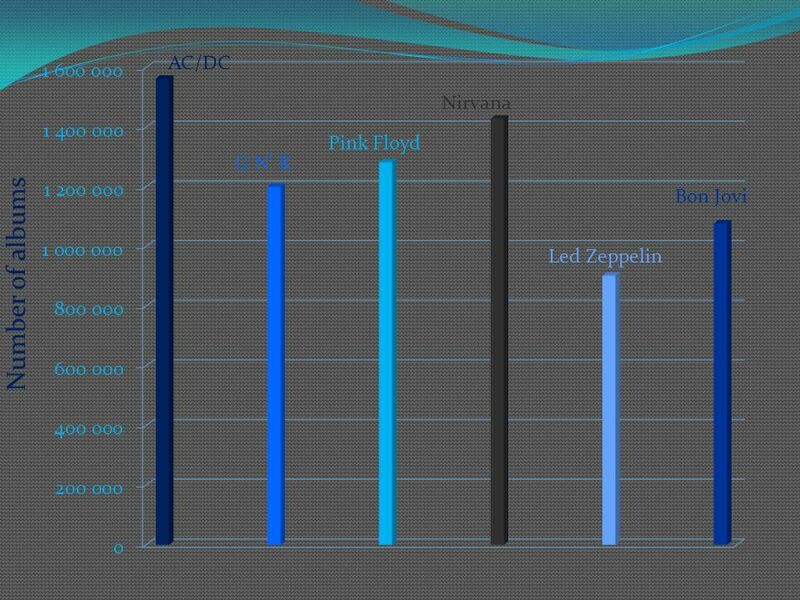 AC/DC sold the most albums on average per year, with 1,562,500 albums in a year. 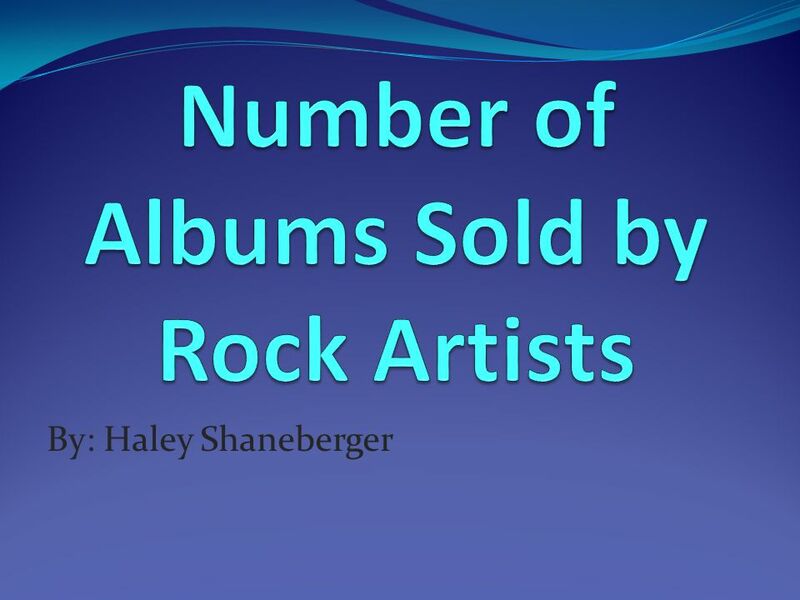 Download ppt "By: Haley Shaneberger. Albums sold Years the album has been out YXYX Nirvana." When Music Leaves a Permanent Mark Melody Wilson. Annotations of CD covers within our chosen genre..
1980’s - Present.  1980’s glam metal developed out of the disco and rock movements of the 70’s.  The 1980’s were all about excess, and the music scene. All About Travis Weber PETS MUSIC MY FAVORITE. Juan, a fifteen foot albino burmese python, is my favorite pet. Rock Music Work is made by: Olga Prudnikova Elena Anisimova Maria Solopova Teacher: E.A. Ermachenkova. WELCOME TO THE QUIZ Instructions: In this quiz you will be shown a number of famous album covers with their names and artists removed. Click on the correct. 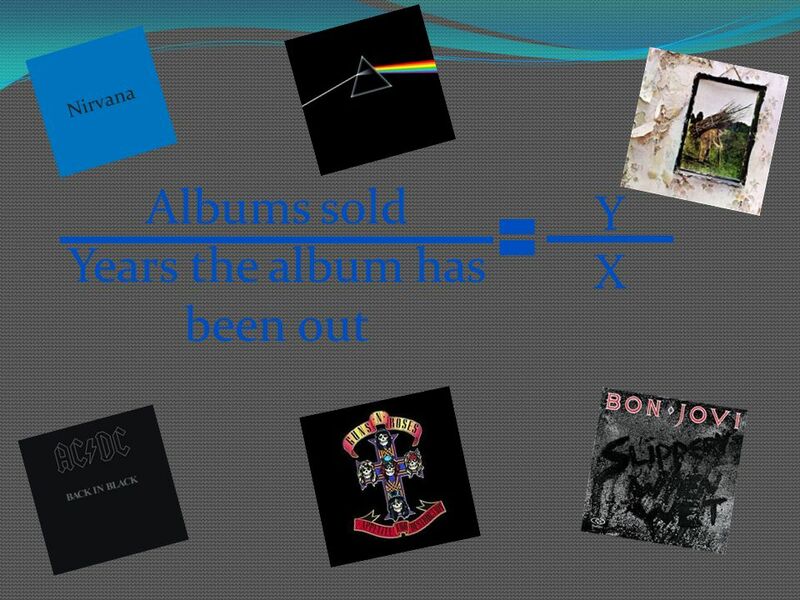 This Presentation will take you on a tour with the greatest rock and roll band of all time. Presented By: Nick Mangone Project 11 May 24, 2011 Next. I behold the Christ in you Here the life of God I see I can see a great peace too I can see you whole and free I behold the Christ in you I can see this. Grunge, pop-punk and the 1990s, and popular music from 2000. 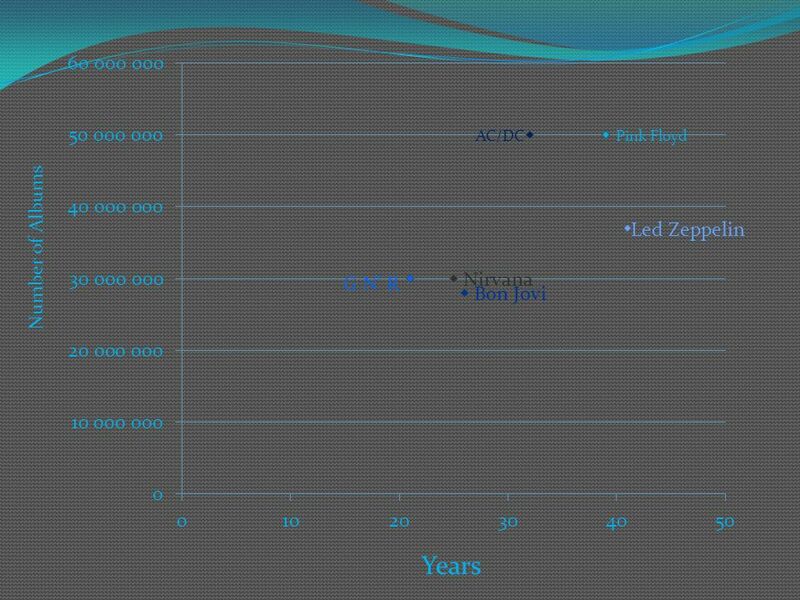 Investigation of the role of Heavy Metal in the music culture. Shawn Guise And Tim Emig And Nathan Weaver.  Heavy metal started in England with Black Sabbath in England playing dark melodies. Black Sabbath’s lead. Pink Floyd. Pink Floyd – History & Significance Syd Barrett - guitar, vocals; died 7/07/06 David Gilmour - guitar, vocals Nick Mason - drums Roger Waters. ROCKING THE BRITISH STAGE IN THE LAST CENTURY. Rock music, also known as "rock and roll", is a style of music that became popular in the 1950s. TAPE 14 EARLY METAL ART ROCK. Stairway To Heaven – Led Zeppelin 1971 from the album from the album (Led Zeppelin IV) biggest-selling single piece of sheet. Rock Music of the 70’s By Trevor Davis. Intro to the 70’s Rock Scene After the initial invasion of the British on the rock scene we entered what I consider. Lady Gaga is an American music artist. She began performing at the rock music scene of new York city’s lower east side. Then she went to streamline records.